I discovered this quote on Pinterest recently, posted it in our national student leadership group the other night, and was suddenly struck by its profundity. I am a person who frequently feels tired. Exhausted and sleep-deprived to be more specific. Every night when I set my alarm for the next morning, I sigh at the number of hours of sleep I’m getting. And if I remember correctly, I felt this same exact way last fall – and the fall before that. It’s the beginning of the school year. And it takes more energy than I sometimes think I have. I pour my heart into improving my teaching strategies and plans. I agonize over all the new things that I’ve learned lately and want to implement – yet I just feel like I can’t do it all perfectly. Additionally, I want to be a faithful college ministry leader, pouring into college students’ lives – and a faithful HYPE leader, pouring into my HYPE affiliates across the country – and somewhere in there, I want to be a loyal friend and daughter and sister. Life is full to the brim. And I am so thankful for every single one of those things that I get to do. Yet it truly is exhausting sometimes, and sometimes I do feel like straight up quitting. But quitting won’t really solve the problem. I would get some relief, but really I would feel a void in my life if one of those things were missing. They all fill my life in different ways, and I feel that God wants to use me in all of them still. Learning to rest looks like setting boundaries for commitments. It looks like me not saying yes to every single event and every single committee. It looks like taking an evening for myself at least once a week to let my brain settle – not think at a hundred miles an hour of all that I need to do, work on, improve – just let go of productivity and anxiety and stress. Learning to rest feels difficult because I’ve somehow equated resting with laziness. But if I don’t learn to rest – I will crash and burn, and I’ll end up having less productivity than ever before. I do believe that our all-wise heavenly Father knew that, which is why He wove rest into His plan for His people. He knew that without the command to rest, we humans would let our work consume our lives. We would let it become an idol – something we have to control constantly, something we seek to find our identity in. Resting means leaving it in God’s hands. Resting means – I trust God’s sovereignty enough to take care of all these things tomorrow. It doesn’t mean I’m being neglectful or lazy or irresponsible. It means I am consciously planning breaks into my schedule to breathe, take time out, and focus on what matters most in life – my relationship with God. When we take time to rest, we will come back to our duties and our work with a renewed sense of commitment and energy. We will love what we do again and have the ability to focus on the next steps, instead of being overwhelmed and bleary-eyed towards all of our commitments. This is how God meant it to be – He knew that as humans, our engines would run down and would need re-charging. If we plow on ahead like we’re immune to such a thing, we will inevitably run ourselves into the ground. We all do. We need the time and space to truly become rejuvenated. We need to allow ourselves to engage in those activities that bring true joy and relaxation to our souls, remembering that these, too, are gifts from God. He provided them for us as a way to honor Him more with our time when we invest it into other people through our work, ministry, family, and community. And we also mustn’t judge other people for taking that time and space to rest. If someone needs a night off from an activity or commitment, we shouldn’t express our disapproval with raised eyebrows or pursed lips that they’re “skipping out” on responsibility. 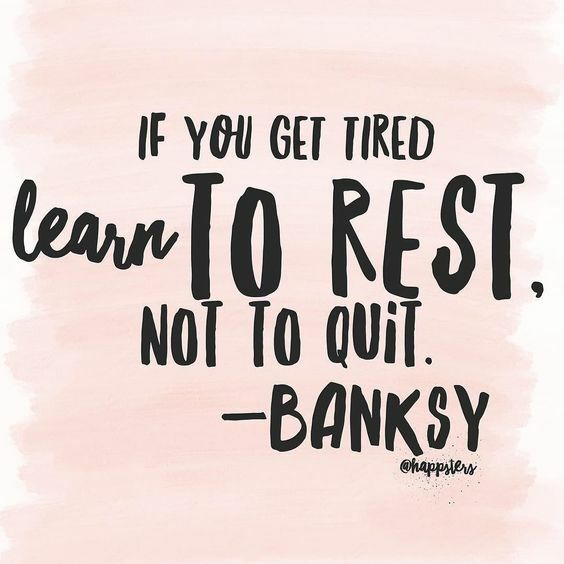 We need to support one another in our human frailty, and give approval to the need to rest and recharge – because we’ll need it, too, one of these days. There is no guilt in resting. If we are resting in who Christ is, what He’s done for us, and who He’s making us into, then we don’t need to feel guilty about what we’re not doing. If we are doing kingdom work every week, investing in lives, loving others, and being faithful to our jobs, then taking a night or two to ourselves to just breathe is not only allowable, but also necessary. You will be able to love others better if you let your brain rest just a little bit. And you’ll be doing exactly what the God of the universe – who doesn’t even need to rest – did on the seventh day of creation. I’m pretty sure He knew what He was doing.